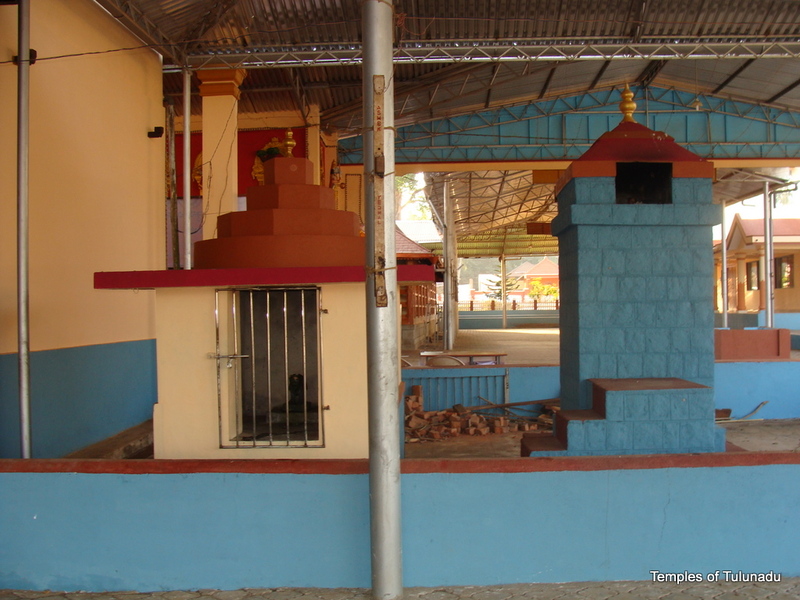 This is a placeholder article because when I visited the Mrutyunjaya Rudra Somanatha Temple at Bola on the Karkala – Udupi highway, the temple was closed. I spent some time waiting for the temple authorities to turn up, but had to get back after waiting a while. Someday I will get back and get inside the temple and collect more information. For now, all I have is some pictures taken outside the temple. Pavanje is one of the most well known villages in Tulu Nadu. It has a rich history associated with its temples and village itself. 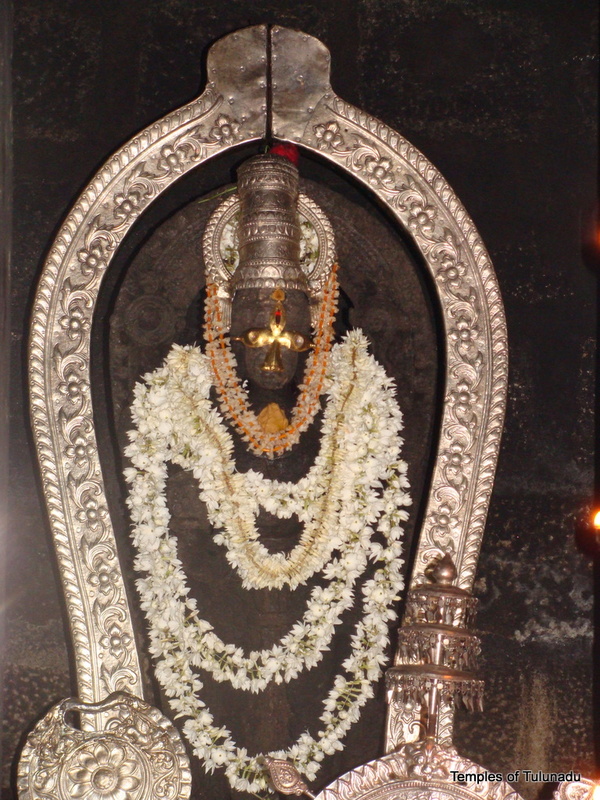 It is also one of the few villages in Tulu Nadu which has three well known temples. Pavanje has a Durga Parameshwari Temple and a Subramanya Temple but the most famous amongst the temples is the Mahalingeshwara Temple. It is the latter temple that I am writing about here. 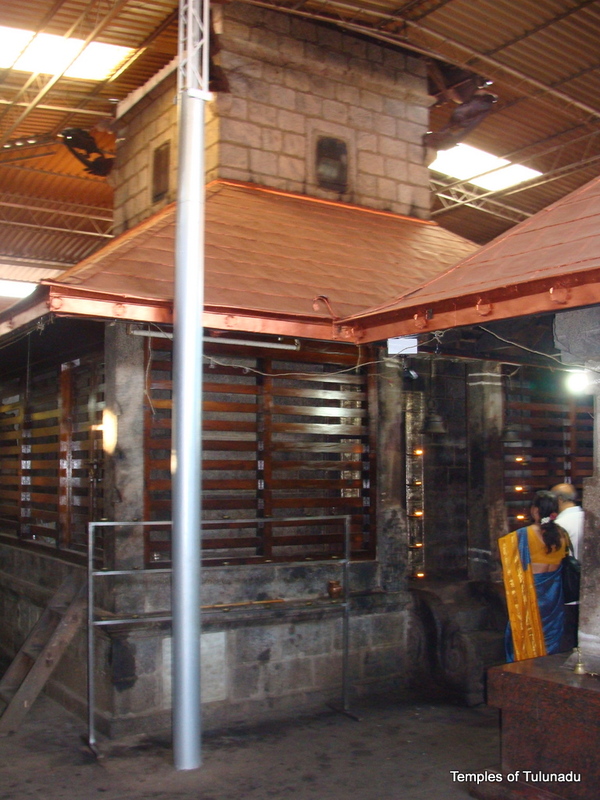 The main deity of this temple is of course Sri Mahalingeshwara. The temple also has a Mahaganapati temple but the Ganapati idol is located outside of the main temple complex, just to the right. Such a placement is very rare in Tulu Nadu temples. 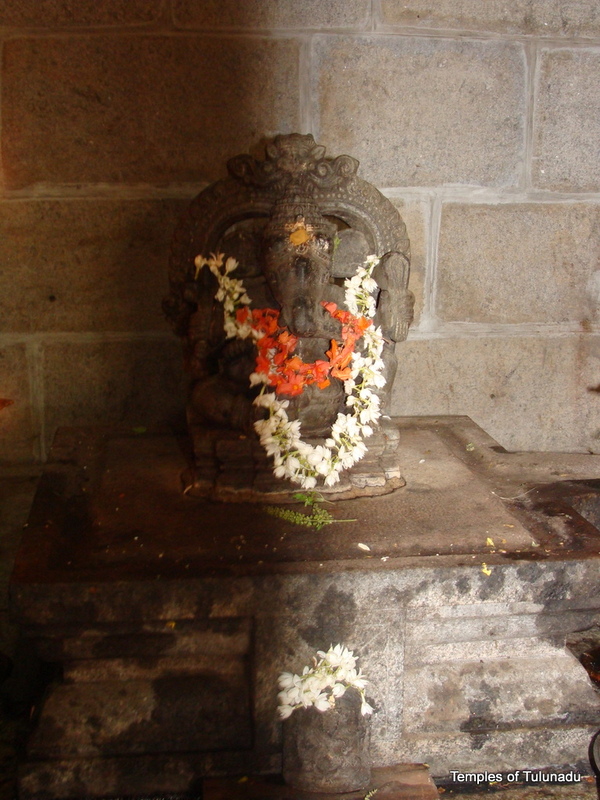 In most other temples, the Ganapati idol is found right next to the main Garbha Gudi. The temple authorities did not allow me to click the photos of the idols. But a photo was available in the temple office. Am reproducing the same in this article. The village Pavanje and the temple have a recorded history of more than 600 years. There are several inscriptions and other archaeological evidences of the temple in and around Pavanje. The Kings of the Hoysala kingdom and later the Vijayanagara kings were great patrons of this region. Several grants have been made to this temple by them. The grants made in 1397 A.D and 1438 A.D have been recorded through inscriptions at the temple. The temple itself is built on top of a hillock right next to the Pavanje river. This river merges with Shambhavi river a little further down in Mulky and merges into the Arabian Ocean. 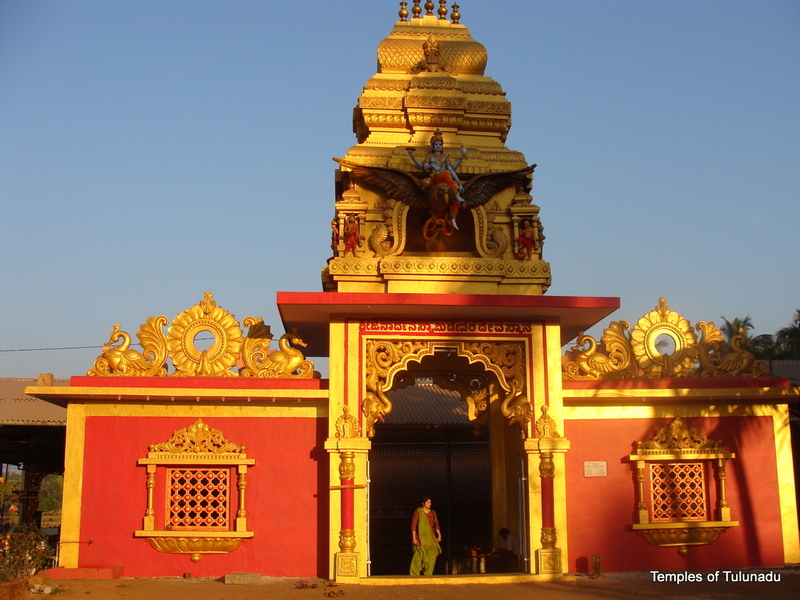 The temple is constructed in typical Tulu Nadu style and offers a panoramic view of Pavanje and surroundings. The main Bhuta of this temple is Jarandaaya. The Jarandaaya daiva sthana is located at nearby Haleangadi. Other Bhutas include Rakteshwari and Koddabbu. There is a Naga Bana associated with the temple and also a “Brahma Sthana”. In fact, the Naga and Brahma worship of Pavanje is very well known in this region. 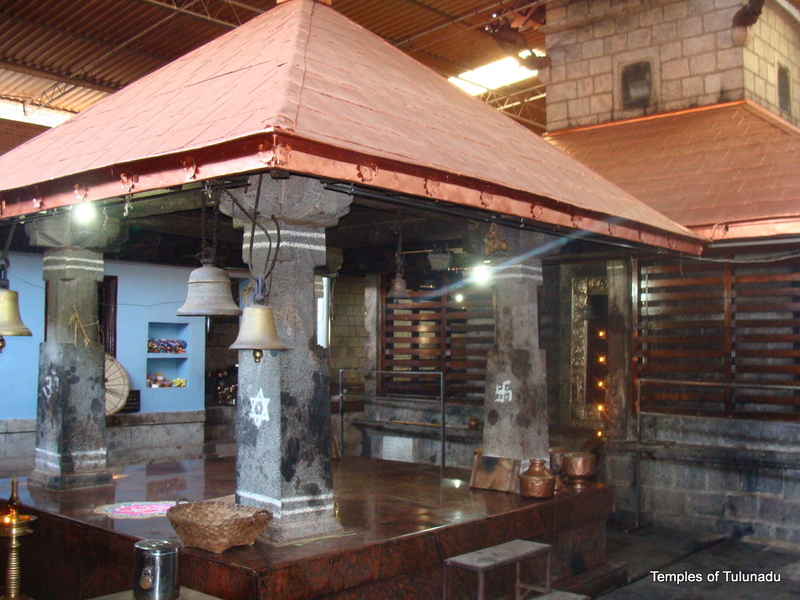 Address: Sri Pavanje Mahalingeshwara Mahaganapati Devasthana, Pavanje, Haleangadi Post, Mangalore Taluk, Dakshina Kannada – 574 146. Annual festival: For eight days every year starting on Maha Shivaratri. The Jaarandaaya Bhuta Kola is held on the 9th day. Specialities: During the annual festival, there is a custom that no other auspicious event should be conducted in the village. Though this is prevalent in many other villages, it is still very strictly adhered to in Pavanje. Also, the villagers of Pavanje do not leave the village once the Jaatre starts. Even if they have to leave the village for emergency purposes, they make it a point to return before the temple flag is brought down on the last day. More photos of the temple can be found here. I know I begin almost every article on a Temple by saying its an “extra-ordinary” or “unique” temple 🙂 but trust me, that’s exactly what they are! As I continue my discovery of Tulu Nadu, my awe for this great great place only keeps increasing. This time, I managed to cover Athuru Bailu, a tiny hamlet near Kinnigoli-Mulki. Athuru Bailu has an ancient Maha Ganapati temple. Believe it or not, this temple is actually just the God worshipped at the home of the Udupa family of Athuru Bailu! The sanctity of this place is so high that the nearby villages consider it as a temple. People who pass by the Udupa home, stop by, get into the ‘temple’, offer their prayers and only then do they move on. The temple, its idol and the Udupa family have a recorded history of more than 700 years! Two Udupa brothers came down south from Kandavara in search of a better place to reside. They came along with their diety – the Mahaganapati. Local legend has it that when the two brothers were walking near Athuru, a cloud was following them to protect them from the heat. Villagers saw this and reported it to the local chieftain. He requested them to stay back in his village and asked them to choose any place they liked. When they came to the place where the temple is currently located, they found a mongoose and snake co-existing. They instantly chose the place and the temple has existed ever since. Out of the two brothers, one of them settled down in nearby Bappanadu Sri Durgaparameshwari Temple. In fact, the Udupas of Bailu played a pivotal role in the establishment of the Bappanadu temple. Even today, during the annual festival of Bappanadu, a customary felicitation of the Udupas is done as a mark of respect. Along with the Mahaganapati, Bailu also has the Panjurli Bhoota. It is believed that Annappa Panjurli Bhoota came down to Bailu from Dharmasthala when one of the Udupas had gone there for a visit. Trust me, the Panjurli of Bailu is one of the most powerful Bhootas in Tulu Nadu. Even to this today, during the Bhoota Kola, there is a segment when Panjurli ‘demonstrates’ his power by throwing the Udupas up from their seats and knocking them unconscious. No one except Panjurli is able to wake them up! Watch this youtube video to see what I am talking about. The Athuru Bailu Udupa family is one of the most well known families of Tulu Nadu. They are the official astrologers for even the Kateel Sri Durga Parameshwari Temple! The almanac they bring out is the most widely circulated almanac in the entire Tulu Nadu region, and has been published for over 100 years now. How to get there: From Mangalore reach Mulki and turn right towards Kinnigoli. About 1km before Kinnigoli town, turn right towards Balavina Gudde. Athuru Bailu is about 5kms from this junction. Locals will accurately guide you to the temple once you take the turn. Specialities: “Appada Puje” is very famous in Bailu. Locals get this seve done very regularly. Appa is a special sweet dish, prepared for Ganapati in Tulu Nadu especially. In Appada Puje, a whole lot of ‘Appas’ are made and offered to Ganapati. Ganesha Chaturthi is an important festival celebrated in Bailu. The Panjurli Kola is held about 3-4 times a year on important ocassions. The Nandini river flows very close to the Udupa home. Every day, the priest has to compulsorily take bath in the river and only then worship at the temple. Kathelsar is a tiny tiny hamlet, found on the stretch between Nellitheertha and Bajpe. There are probably, just a few tens of houses in this village. One can find a very ancient Vishnumurthy temple in this village. In addition to the main diety, there is also a Ganapati idol in the temple. The Ganapati idol is made of white stone and is significantly different from the idols found in other temples around here. The temple is not really in a good shape at all. The priest’s family are doing their best to maintain the temple on a daily basis. But the temple could do with a lot of renovation and repair. It is sad to see such a serene place being neglected so badly, although this is not the only temple in Tulu Nadu which is facing such a situation. The main bhoota worshipped here is Panjurli. Due to the lack of resources, the temple management conducts the annual festival for only one day – during the full moon day in the solar month of Vrushabha (around May-June). How to get there: Reach Bajpe from Mangalore. Take the road to Nellitheertha (Kateel road). Kathelsar is mid-way on this stretch. Kompadavu is a small village in Mangalore Taluk of Dakshina Kannada district. It is very close to Nellitheertha and Muchur. 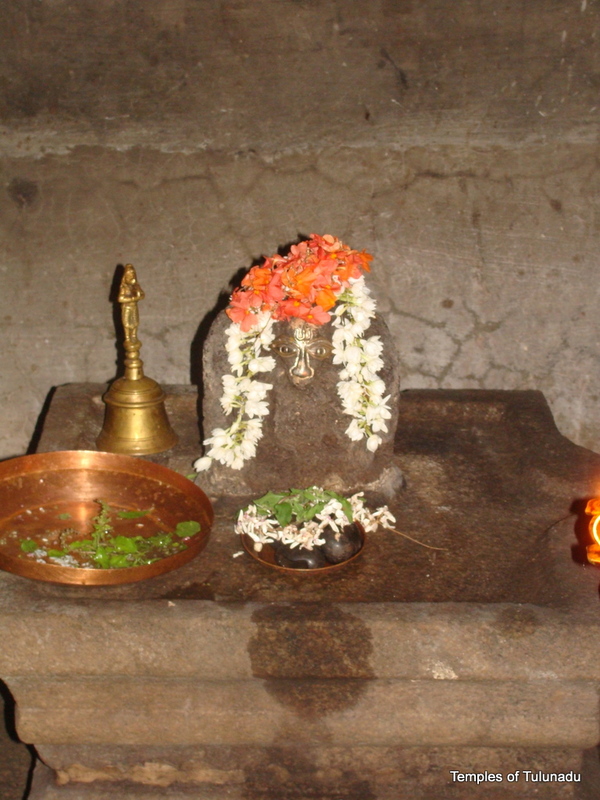 Kompadavu has a small and ancient Vishnu temple. The diety is actually called “Vishnu Murthy”. This temple has close links, in terms of its mythological origins to the Nellitheertha and Muchur temples. According to the legend of the place, when Sri Durga appeared in front of Sage Jabali at the Nellitheertha cave, she bestowed a boon on the region and said that Shiva, Vishnu and Durga would reside in that region. Consequently, the Muchur Durga Parameshwari temple, the Nellitheertha Somanatha temple and the Kompadavu Vishnumurthy temple came into existence. The place is also known as Kovalapura in ancient records. The temple is not in a very good condition. The worship, and rituals though, happens without fail. The archaka family which stays close by, is very dedicated to the functioning of the temple. The main Bhootas here are Vyaghra Chamundi and Rakteshwari. How to get there: From Mangalore, take the Moodabidri road. Cross Gurupura, Kaikamba and Ganjimatha. 3kms from Ganjimatha, turn left towards Niddodi. 4kms on this road, turn left at Manjana Katte. Drive 2kms to reach the temple. This past weekend (Feb 28 and Mar 1), a very special and rare seve was offered to Lord Mahaganapati at the Nellitheertha Somanatheshwara Cave Temple. The seve is called as “Moodappa Seve” or “Apoopa Seve”. Just like Laksharchane where thousands of flowers are offered, this seve consisted of offering thousands and thousands of “Appa”, a sweet dish popular in Dakshina Kannada. “Appa” is equivalent to the Modaka offered in other regions. Since Ganapati is believed to like Modakas a lot, the entire idol of Ganapati is covered (till the nose) with Appas and other dishes. Such a rare seve happens seldom. One famous temple where such a seve happens regularly is the Madhur Ganapati temple in Kasaragod. In Nellitheertha, the entire ceremony was spread over two days. It started on Day 1 with a prarthana and Punyahavana for purification of the ingredients to be used in preparing the dishes. Subsequently, during the day, a grand Ganapati Homam and Kalashabhishekas (Panchavimshati – 25) were performed to both Lord Somanatha and Mahaganapati. Meanwhile, the preparation of the “Appas” started. It was a overwhelming sight to see thousands and thousands of sweets being prepared. The entire team of cooks was taking extreme care and interest in preparing the dishes. Several baskets full of dishes were ready by evening. At the same time, the Ganapati Gudi was also getting decked up. In the evening, there was a Bharatanatyam dance program by Kum Megha Kakkillaya, offered as a service to the temple. It was an excellent program and Kum Megha’s performance was stunning. In preparation for the Moodappa Seve, a special “Ranga Puje” was held for both Mahaganapati and Lord Somanatha in the evening. 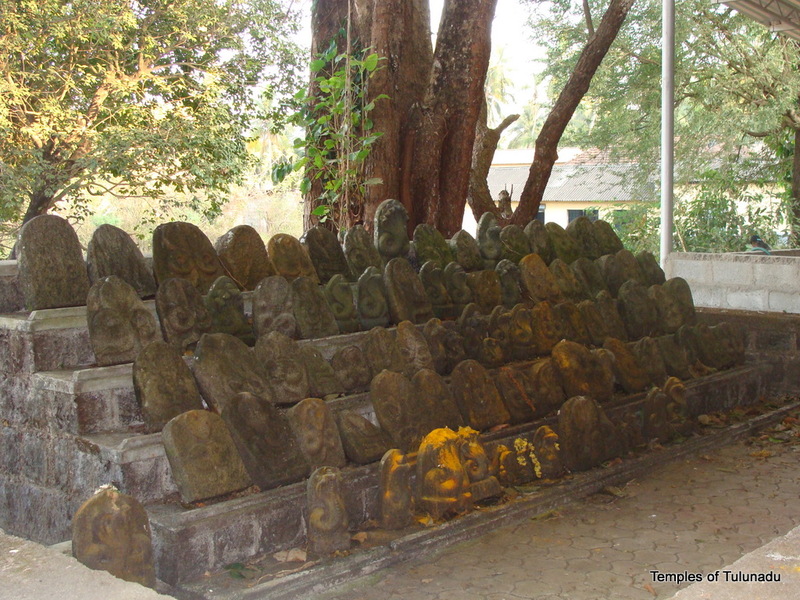 The Ranga Puje is, once again, a unique offering prevalent in Dakshina Kannada region. Next, the idol of Mahaganapati was ‘readied’ for the Seve by cleaning, etc and the various dishes were brought in front of the Gudi. The whole ritual was conducted by Sri Baggamajalu Subramanya Tantri and his team. After that the seve began. It took more than an hour for the team of Archakas to fill the entire Gudi of Mahaganapati with the Appas and other dishes. The offerings were poured in so as to cover the idol, except for the face! It was a beautiful sight to see. It was getting close to midnight when the entire offerings were put in. The idol was then covered with silk clothes, dry fruits, flowers and other things. Mahaganapati was ‘resting’! and the entire temple was closed. Silence all around as Ganapati was in ‘Shayana’. The ceremony on day 2 started early – at around 6:45AM. It began with the Kavatodghatana (door opening ceremony). Rituals were conducted to ‘wake’ Mahaganapati up from the sleep and the various offerings were removed one by one. Finally, a Panchamruta Abhisheka was performed for Mahaganapati. In the afternoon, a Maha Puje was conducted followed by Mantrakshate ceremony signalling the successful end of the Moodappa Seve. It was a thrilling experience to be part of this seve. Truly, I had never seen anything like this before. More photos of this event can be seen here.